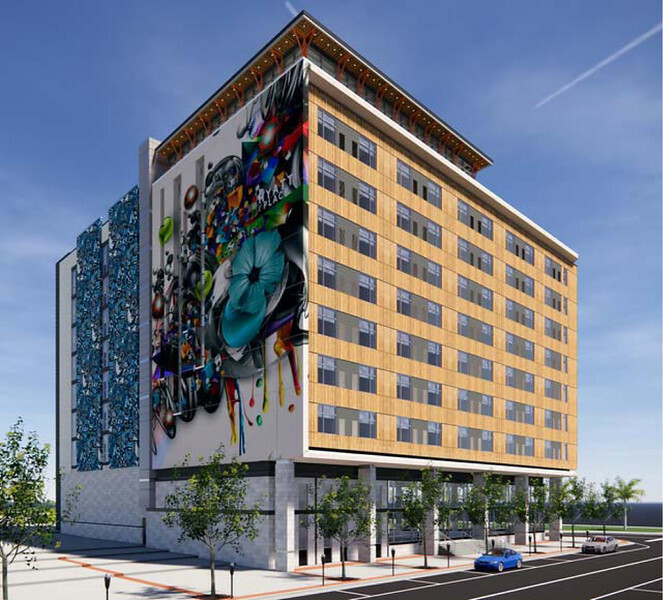 Plans for a 9-story Hyatt Place hotel were recently submitted to the Downtown Development Review Board (DDRB). Plans for the 128-room hotel include a first floor restaurant and bar, a second floor pool deck and fitness center, and a rooftop patio and event space. The project would use on-street parking along Hogan Street and spaces in an existing adjacent five-year-old parking garage. However, what should not be lost and forgotten in time is the story of how this site was created to allow for 2018's infill hotel development. Site of proposed Hyatt Place Hotel. Courtesy of Mike Field. This Hyatt Place project serves as an example of how community awareness, will, and advocacy can reshape decisions at the planning level that then incrementally lead to a vibrant pedestrian-friendly outcome. The timeline for the Hyatt Place project actually dates back to 2012 when Parador Partners LLC. first attempted to move forward with the development of a parking garage adjacent to the SunTrust Tower. 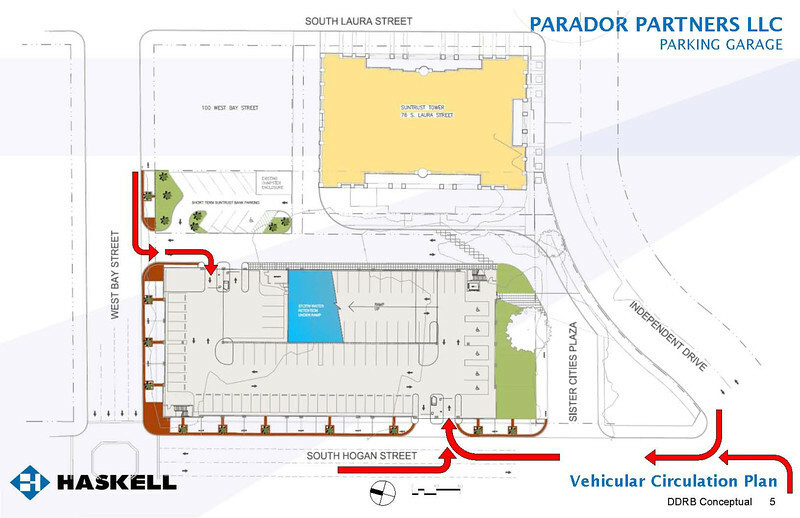 The original design for the parking garage along Hogan Street would have added a road circling the structure, leaving no room for street level retail. 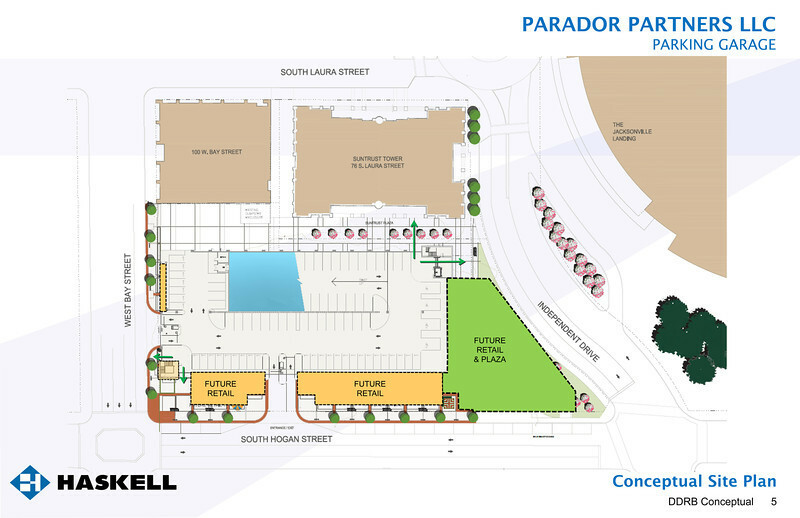 Designed by Haskell, the original Parador Partners parking garage would not have accommodated ground level retail spaces despite being located directly across the street from the Jacksonville Landing. Several excuses were made to the DDRB why the project could not support retail in the design, including a lack of market support and the developer’s desire to avoid the $300,000 cost of adding sprinklers to the project as a part of the fire safety design, despite receiving $3.5 million in incentives from the city. 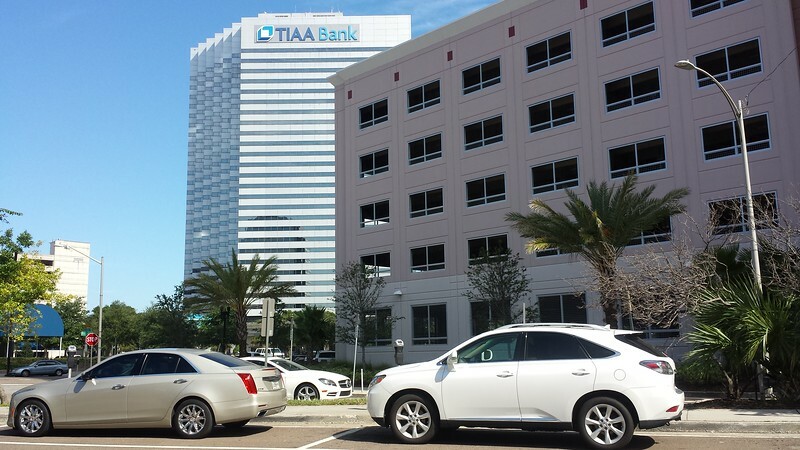 Submitted to the Downtown Development Review Board (DDRB) for conceptual review in June 2012, Haskell’s design encountered heavy public opposition for its lack of street level retail and creativity for a garage proposed on one of downtown Jacksonville’s most desirable sites. This led to the concept being rejected by the DDRB and a workshop being scheduled to assist in the development of alternative design concepts. Greenville’s Spring Street parking garage. Fearing that a garage being built on the block alone would establish a dead pedestrian zone in the heart of the city for the next century, an alternative concept based off the site design and development strategy for a garage in Greenville, South Carolina was created and offered up to the DDRB and design team. In Greenville, the Spring Street Garage was constructed in the middle of a block, opening space along the sidewalk for infill development at a future date. Considered a compromise, this solution was intended to preserve space for infill retail opportunities, while also maintaining the financial feasibility of the parking garage project. This June 13, 2012 sketch by Modern Cities’ Ennis Davis was created to illustrate how the garage could be set back from the street in order to accommodate future retail. 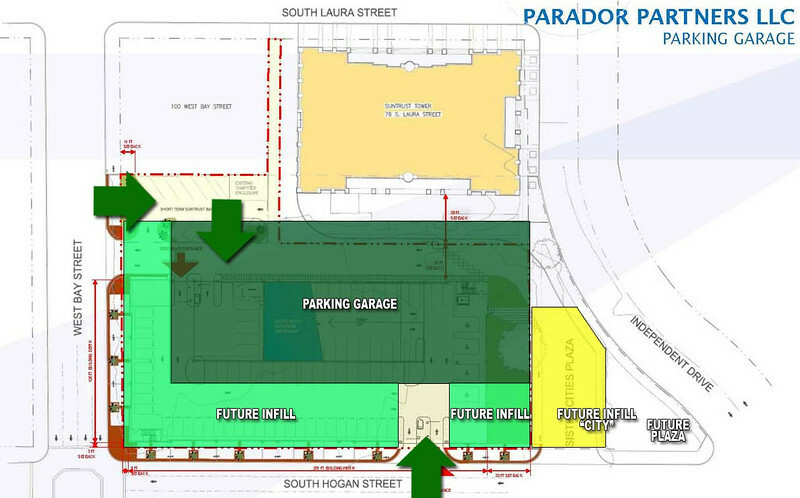 Revised plans submitted to the DDRB for conceptual design review by Parador and Haskell’s design team in September 2012, included this slight modification in the garage concept, opening an array of future infill opportunities in the heart of downtown without increasing costs to the developer. Revised plans that accommodated space for future street level retail. The Court Urban Food Park. Courtesy of Mike Field. 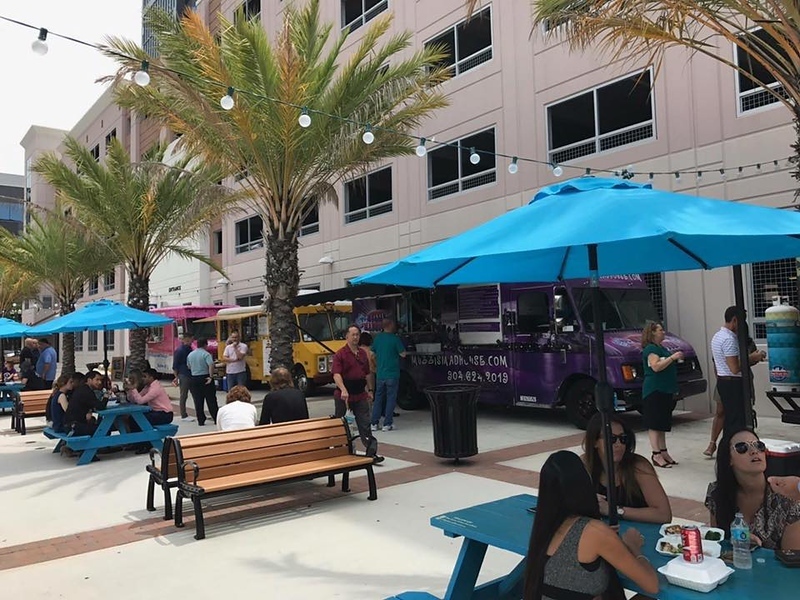 Along with The Court Urban Food Park, Fort Lauderdale-based Mainstreet CV 76 S Laura Street LLC’s intentions of adding a Hyatt Place hotel solidified the vision expressed six years ago. When complete, the 102,256-square-foot hotel will bring additional foot traffic in the immediate vicinity and active this 0.27-acre site with more commercial use via the inclusion of a restaurant and bar at street level. Unlike many competing hotel proposals that include large amounts of surface parking, the presence of the existing adjacent parking garage eliminates the need for parking to be included in this project, making it financially feasible to develop a truly urban and pedestrian-friendly footprint. As a result of a simple conceptual planning design modification made six years ago, this block of Hogan Street is well on its way to becoming one of the Northbank’s most interesting and active destinations.